To the thousands of people who stream through Waterbury Hospital's revolving glass doors on a weekly basis, he was Howard, the little man in royal blue jacket and wire-rimmed eyeglasses, eager to point them in the right direction. To my husband, his family-and me for the last eight years-he was simply Grampa, a constant and attentive presence. He monitored his weight-138.4 pounds-and blood pressure daily, as he did California earthquakes, always a potential peril to one of his grandsons. He ate fried eggs, bacon, and toast in the hospital cafeteria every morning, observed the afternoon meandering of family cats and questioned and challenged my husband's fancy new GPS navigator. After all, he knew the distance from Exit 18 to his Town Plot home better than any machine. Howard Parsons' life and career were not extraordinary, but his simple kindness was. 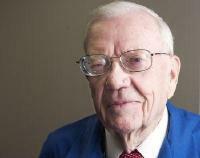 A Waterbury native, he worked in various factories throughout the city after serving in World War II. For the final years of his professiobnal career, he was a compositor here at the Republican-American, where his beloved wife, Ruth, was a reporter up until her death in 1973. After Ruth died and retired life tending to his rose bushes and making wind chimes grew tedious and unfulfilling, he found a new love-Waterbury Hospital, where he volunteered as a greeter for the last 21 years. He brought the same solicitous efficiency to the position as he had to his assiduous, but respectfully distant, role as grandfather. At the hospital, he was known affectionately as "the mayor". There, he recognized when a harried relative needed to quickly find a sick loved one. He'd direct them to the elevators and stand guard for the next visitor, maybe trading small talk with familiar doctors, visitors and hospital staff, but not too much, because he, like them, had a job to do. He didn't want to be a "bother" to anyone. When his grandsons phoned to say "Merry Christmas", he would thank them for their call, ask how their "beautiful" wives and children were, and all but hang up on them-lest anyone waste precious cell-phone minutes on him. One grandson timed a call at a record-breaking 34 seconds. Likewise, he didn't want to be a burden to the country. When his daughter tried to help him file his taxes so he could receive the recent rebate, he said he neither needed nor deserved it since he hadn't been paid to work in decades. His tastes and desires were simple. He liked to sit out in the sun on a warm spring day, and hoped to soon meet all three of his new great-granddaughters. He retrieved "cheergrams", e-mails sent to patients through the hospital's website, which he attentively pasted into a document, dolled up with a pretty font and delivered to patients' rooms. Undoubtedly, he had the inside scoop on who was sick in Waterbury on a daily bassis, but he certainly never shared any juicy tidbits with me, a newspaper reporter. Delivering cheergrams not only kept him busy-his never-endfing quest- it made him feel closer to Ruth, a woman he deemed irreplaceable. Ruth had been active in the community and was instrumental in establishing Naugatuck Valley Community College in Waterbury. The road leading into the campus is named in her honor. Last fall, his 20,000 hours of community service led to his being named Waterbury Hospital's Humanitarian of the year. Grampa was a humble man who didn't like to attract attention, but at the hospital's annual black tie gala, dressed sharply in a tux and flanked by family memebers who flew in from Denver, he radiated pride. "Mommy would be so proud", he said, speaking of his late wife. Whenever I visited Waterbury Hospital for a story assignment, I was bound to run into Grampa. Once, as I walked down the hallway with a hospital employee, focued on what she was saying, I saw Grampa out of the corner of my eye. He buzzed by at a speedy clip and didn't say a word. He didn't want to interrupt my "important" business. Last Friday, Grampa fell down a set of stairs. It seemed to be the only event that could slow him down. Somehow, he crawled up the stairs, retrieved the phone and sat at the kitchen table to wait for his daughter. He apologized for being a bother, and said he was in no pain, despite the obiously shattered arm and other damage, and insisted she still attend a friend's party that night. He arrived by ambulance to the place he loved so much. He was treated like a fallen president. Staff rallied to see what they could do. They consoled the family and made sure he had the best care. Grandsons flew in from Italy, Denver, and Los Angeles. The news was grim. Grampa would die. His daughter found a living will with his papers asking that he not be kept alive artificially. He also left a letter to his two daughters, Patricia and Beth: If you found this letter, it means I have gone to be with your mother, he wrote. It's what I want. Please let me go. So they did. Grampa, 89, died peacefully Thursday. In his passing, his family and the Waterbury community lost a decent man who, through simple acts of kindness, brought the cheer and comfort most urgently needed, and never fully appreciated, until it is gone. I chose not to be in the room last week when doctors disconnected my grandfather from life support. I'm told he died peacefully. That he wouldn't recover seemed possible from the day he fell, a week before. Even for someone as active and healthy as he was, an 89 year-old body could only take so much. Doctors confirmed the worst a few days later. After a weekend of hoping for the best and planning a long recovery, they delivered the grim news: The damage was too severe. He could be kept alive on life support indefinitely, but he would never again be the person he was. With explicit instructions in a living will that he did not want to live like this, the family decided, with his doctors' blessing, to let him go. It was, we were told~and I believe~ an act of kindness in accordance with his wishes. When his breathing tube was removed, his heart continued to beat for several minutes before he slowly, quietly slipped away. That he won't be there for the next round of birthdays and holidays is, for now, the hardest paart. He's simply always been there. Quieter in the last decade or so than in my earliest memories of him, my grandfather was never the center of attention, but he was also never not there. The ritual of death requires that we remember what was best about a person. And about my grandfather, there is much to remember fondly. His two daughters, six grandsons and eight great-grandchildren will remember him as someone who always wanted what was best for others and never wanted to be a bother. Waterbury Hospital will remember another side of him. For more than 20 years, he gave of himself freely there, amassing 20,000 hours volunteering in any capacity he was asked. Perhaps his most fulfilling task was that of hospital greeter, where his would be the first face visitors would see. He knew the hospital better than anyone, and could get people where they needed to go and answer any questions they might have. If he couldn't, he'd find the person who could. His work brought him last year's Humanitarian of the Year award at the hospital, an honor her cherished. He lived a long life and never wasted a day of it. That's about the best any of us can hope for. But the good memories that come to the fore with someone's death also have a way of obscuring the whole person. My grandfather was many things, most of them good, but he was no more a saint than anyone. By focusing only on the good, we lose the whole picture; we lose what made the person unique. For example, no one talked at his funeral about my grandfaher's love of a good argument. This tendancy faded in the last few years, but for the longest time, he loved nothing more than being the contrarian, seemingly for its own sake. It would reah the point that unspoken rules were enacted to keep anything remotely controversial~not just religion and politics, but science, sports, family memories, you name it~ out of the conversation. It sounds lovable in retrospect, but at the time, not as much. None of this is to imply my grandfather was anything other than a good man. Without question, he was. But he was also, like everyone, complicated. Along with grief at his passing, I feel lucky I was able to know him so long, and get a chance to understand his different sides. About his wife, my grandmother, I have much less to go on. She's been gone so long, all that's left are the angelic glows of a woman who died far too young. I'll never get to know who she was. I'll never hear firsthand her stories of being a pioneering female reporter in a male-dominated profession. I'll never hear from her the story of how she helped bring a community college to Waterbury. [S915] The Waterbury Republican-American, 6 June 2008, Page 1 D.
[S916] Connecticut Post, 13 June 2008.